It was a great day for CHRC! Congrats to all of our 23 finishers!! Andrew, Guillermo, Michael, Walt, Leslie, Gideon, Nicole, Sonya, Amanda, Kay, Aliza, Sebastian, John, Ethan, Emily, Sophie, Rachael, Elizabeth, Shelley, Madeline, Erin, Priti, AND Zoe! What was your race experience like? 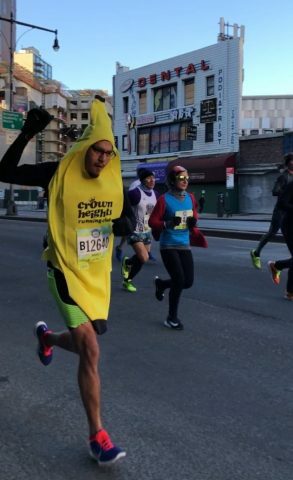 The 2018 NYC Half was an awesome experience! I was really excited about the new course. The fact that it started right in our neighborhood added to the excitement. There is a proverb in Spanish that says, “El hombre propone, pero dios dispone”. It roughly translates to “A man can plan and prepare all he likes, but God has his destiny preordained. I had done lots of meticulous planning and everything seemed to be aligning, but you can’t control two things: getting sick and the weather. On race day, I was recovering from a bad cold that earlier in the week made me contemplate not racing. The temperature was 28 degrees and windy. Needless to say, it was cold! Luckily, I drew from Gideon’s wisdom and prepared by bringing a hat, an old jacket, old jeans, and a heat sheet to keep warm and toss at the beginning of the race. That plus two sets of hand-warmers and the thousands of people around made the weather more manageable. Last year, I had the pleasure to chase after our very own Kay and start at the corrals with Jimmy and Akil. This year Kay was injured and taking it easy. Gideon was running this year, but not racing either. He had a 20 miler scheduled as part of his NJ Marathon training. As I was waiting in the corral, I met someone from the Queens Distance Runners Club. After awhile, you start seeing the same people in your corrals. Though we’d seen each other, we’d never had a conversation. He was unprepared for the cold, and since I wasn’t using the heat sheet, I offered it to him. He gladly took it. We shared our goals and before we knew it, it was game time! As people began to move to the starting line, I noticed that my right shoe lace was loose! I almost panicked! I had flashbacks from last year’s Staten Island Half Marathon, where my shoelace came untied three times. I got a hold of myself, moved to the right side, and made sure both laces were secured! I was planning on running according to effort and not looking at my watch. Last year, I kept looking at my watch and in Times Square someone yelled, “Hey banana, just run! Stop looking at your watch!” Ever since then, I don’t look at my watch until the end of the race. The excitement made me forget about my sore throat. I usually keep to the left during races because it tends to be less congested, but I knew that the cheer squad would be on the right. I thought that being on the right side would help with pacing since it would be congested. I was wrong! It was as if someone was playing a joke on me. The path was clear and then before mile 2, I passed the 1:25 pace group! I felt good. My breathing was constant and I felt I could keep up that pace for 11 more miles, so I figured maybe I could do something close to that time. Shortly after that, I passed the royal banana CHRC Cheer Squad. It is always nice to see your fellow teammates braving the temperatures to cheer you on. That was adrenaline boosting! Climbing up the Manhattan Bridge was tough, not physically but mentally. It was there that the 1:25 group passed me and the 1:30 caught up and I knew I had overreached. From there, the headwinds picked up and at times I felt like a kite! By mile 6, my legs felt extremely heavy. I felt that familiar and unwelcome burning sensation of lactic acid building up. On the other hand, my breathing was fine! It was as if I didn’t even have a cold! Times Square gave me a boost. The crowds were very supportive. It was there that I met up with our former teammate Nigel McGregor. We had planned to start and run together but we missed each other at the start. He told me, “Wait ’til the park and we’ll let it rip!” I smiled, but I was struggling. Somehow, when we entered Central Park, I saw Michael Oria and Andrew Karp! They helped me pull through and my pace picked up. By mile 10 or so, I saw Dan cheering. He called my name but I couldn’t shout back because I literally had no voice! In those last two miles, I kept my eyes on Michael and at the last mile I made my move. My competitive nature took over and we battled in the last 800 meters. I don’t remember who crossed the finish line first, but it was fun and before I knew it, it was over! I saw Nigel and Andrew at the finish line, but it became really crowded and when I looked around, I couldn’t find Michael, Nigel, or Andrew. It was at this time that my body reminded me that I was recuperating from a cold. I began to cough uncontrollably. The usual “Good job, man! I was chasing the banana the whole time!” and high fives from strangers were abundant. The coughing became a bit more manageable. I took a heat blanket from a Volunteer and thanked her. I noticed she was trying to warm up her hands and since I had two sets of hand warmers, I offered her one set. She gladly took them. I was glad to have packed a bag with warm clothes. The temperatures were still below freezing. Overwhelmed with that classic runners’ high, I went to the Running Center to warm up and had my medal engraved. Did you train for this race ? If so, how? Yes! This race was my main motivator for the winter and I put lots of work into it. When I started running in 2015, I came across a training app from the shoe company Asics. It is called RUN My Asics and I have been using it ever since. Before I joined CHRC, I used to follow the plan the app provided almost religiously. But I love to run with the CHRC crew, so I transitioned and began to use the app’s training plan as a guideline and sort of come up with my own training plans. The cool and bad thing about the app, depending on how you see it, is that it remembers whether you’ve achieved your previous goals. This meant that aside from the usual runs with CHRC, I had to incorporate more workouts. It was during one of those grueling workouts that I met my friend Gabriel. We had been “friends” in Strava for awhile, but had never met in person. Then one day I heard some stranger call my name. Shocked, I picked up the pace but he was able to keep up! He introduced himself and that’s how I met my Tempo Thursdays partner. Did you have any goals for this race? If so what were they? Yes! One of the books I enjoyed in the winter was Meb For Mortals: How to Run, Think and Eat like a Champion Marathoner. In one of the chapters, he talks about goal setting and how to achieve your goals. My take on his philosophy is to just let the timing be right. Don’t rush your development and if the time seems right, go for it. He advises runners not to be too ambitious. For example, if your PR is 2 hrs on the half marathon, it wouldn’t be realistic to set your next goal to beat 1 hour and 30 minutes. On the other hand, he warns about setting goals that are too loose and don’t challenge your abilities. So I was inspired and decided that trying to break 1 hour and 30 minutes for the half marathon would be a realistic yet challenging enough goal. Meb also advises the reader to have a backup plan just in case things don’t go according to plan. A week before the race, it seemed like things would be perfect. I had completed all of my challenging workouts at the planned pace. The weather was predicted at 45 degrees and the plantar fasciitis I had been dealing with was almost gone. Then on Sunday night I began to develop that familiar and unwelcomed throat soreness accompanied by an intense burning sensation in the nose that signals the beginning of a cold! As the days went by, I felt worse and worse. Then the forecast changed from a balmy 45 degrees to 27 degrees at the start! 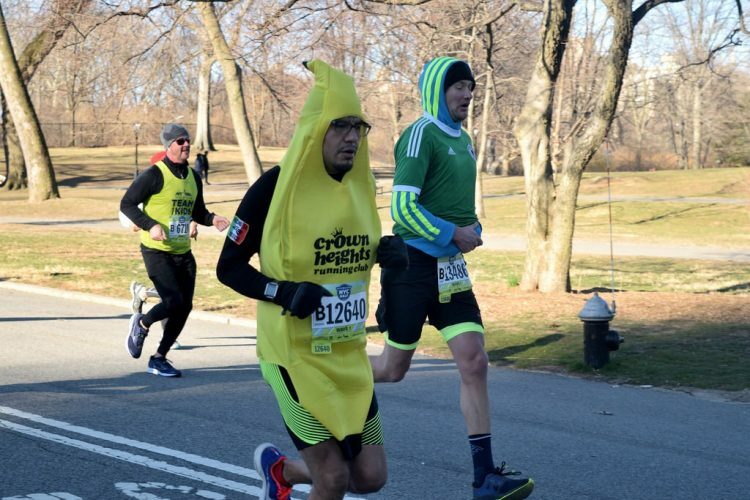 When I try to beat a PR, I don’t wear the banana, because it makes it extra challenging. Worst case scenario plan went into effect. 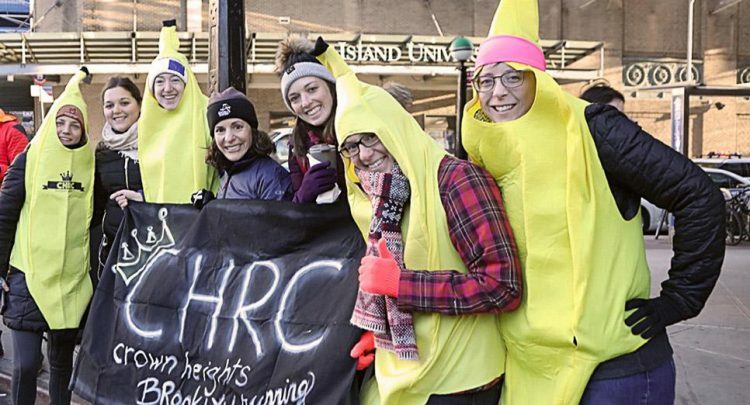 I would wear the banana and try to beat last year’s time while in banana regalia, but if things were really bad, I would just have fun! Did CHRC help you train for/run/celebrate this race? If so, how? Yes! I did about 75% of my total training with the Tuesday, Friday, and Saturday crews. Ever since joining CHRC, I try to make it out to those days. Tuesdays have really helped me develop my stamina and speed. The Friday crew makes sure to have a chill pace perfect for recovery after my Tempo Thursdays and the Saturday crew makes the long miles fly! During the race, the CHRC crew braved the low temperatures and came out to cheer. They are my heroes, but after all, bananas come in bunches. After the race, some of the crew came together at the Dekalb Food Hall, where we shared our war stories (mostly about the cold, wind, and hills), and then headed home to warm up. What was your favorite thing about the race? My favorite part about the race was that the start was literally a block away from my apartment. What was the biggest challenge about the race? Holding back and not going out too fast and the low temperatures at the start. And the headwind that turned me into a banana kite! Would you run it again? What advice/tips would you give to Royals wanting to run this race? It’s easier said than done, but don’t start too fast. The downhill on Flatbush towards the Manhattan Bridge will batter your legs. Do your tempo runs by starting downhill at Battle Hill and finish them by going uphill. That way you mimic the start and the end. Most of us got too psyched by the uphill finish to mimic the start during training, and we paid for it.